In a country blessed with so many natural wonders, the sharks in South Africa’s oceans are some of the country’s most amazing wild animals. 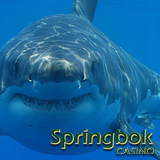 This month South Africa's Springbok Casino pays tribute to the mighty shark. Shark Month will feature a month-long freeroll slots tournament and a special Shark Month casino bonus. This month’s freeroll slots tournament will be played on the popular Crystal Waters slot. Crystal Waters is an underwater adventure with symbols like dolphins, sea horses and turtles. Three yachts trigger 15 free spins. During the free games a wild Bonus Fish may appear and multiply wins up to 8x. Springbok’s Shark Month blog has lots more fun facts and fascinating videos about sharks. Many players will no doubt use some of their Shark Month Casino Bonus to try the new game from Realtime Gaming (RTG) coming later this month. The new Super 6 is a six reel slot game with grouped Wilds that double prizes. Scatters trigger free spins with extra Wilds and 5X payouts. It’s expected to launch May 18th. With hundreds of online slots and table games from RTG, all played in Rands with service in English or Afrikaans, Springbok Casino is South Africa’s most popular and trusted online casino.